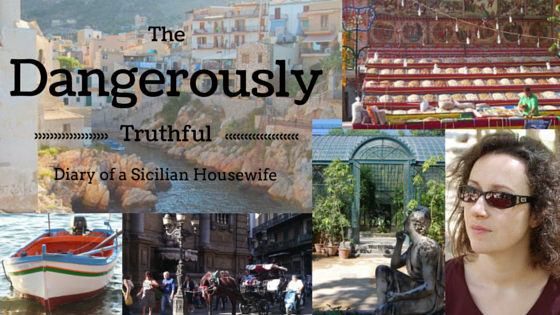 Housewives exist all over the world, but Sicilian Housewives are a unique breed. Are YOU are made of The Right Stuff? Answer a dozen questions to find out! 1. What is the first thing you do when you get up in the morning? A) Have a mug of tea. B) Have a cup of coffee. C) Scrub all the floors in case some dust landed on them over night. 2. When your clothes are all dirty , what do you do? A) Stick them in the washing machine. B) Go shopping for more clothes. C) Squirt each particular stain with a different brand of stain remover, fill the washing powder drawer with antimicrobial disinfectant of five different kinds, and pass the time whilst the machine is running by wiping it down and giving it a French polish. Slosh bleach into the washing powder drawer during the second rinse and, once the machine has finished, repeat the whole procedure again before hanging up your laundry, because displaying a stained item on your washing line would be so humiliating you would probably have to emigrate. 3. Where is your washing machine, anyway? C) On the balcony, so all your neighbours can see how clean it is, and feel inferior. 4. What is the usual number of courses you serve your immediate family for dinner each day? B) None. They know the local takeaway numbers by heart. C) Not less than seven. Being a hosewife is so stressful! Shall I relax by ironing for 4 hours, or have a bottle of red wine and watch telly all morning instead? 5. How do you usually clean the floors in your house? A) Whizz the vacuum cleaner round once a week. B) Rearrange the furniture in a concealing manner whenever a fresh mark stands out more than the others. C) Refuse all social engagements for the day, dress up in a flowery pinny with frills round the armpits and get out 27 bottles of ammonia, hydrochloric acid and other cleaning products which tend to make the dog hallucinate, then scrub the floor with a set of wire scrubbing brushes in 12 different sizes. Then scrub the walls and ceiling as well, just to be on the safe side. 6. What do you use your oven for? A) Heating oven chips and fish fingers. B) Making roast dinners and baking cakes. C) Storing your spare saucepans. If you actually turn it on, the kitchen gets so hot that the oven knobs melt and you can never turn it off again. 7. Just out of interest, how many kitchens do you actually have? B) One, but only because it came with the house. C) Two. One indoors and another one outside on the balcony, which you use when you are planning to cook things by burning them and disappearing inside a cloud of acrid black smoke. This is what it looks like when Sicilian Housewives are frying steak. 8. What time do you start preparing lunch? A) When your tummy begins rumbling around midday. B) You don’t have lunch – what are chocolate bars for? C) At 9a.m. as soon as you have finished sanitizing your house. You are hopping with excitement at the chance to hand-peel 1,000 prawns and just cannot hold off any longer. 9. When someone drops in on you unexpectedly, what do you do? A) Offer them a cup of tea immediately to make them feel welcome. B) Offer them tea or coffee after ten minutes since it would be rude not to. C) Offer them nothing, because they should have had some coffee before they came. And also they should know better than to interrupt you when you are peeling prawns. C) Relaxing. So relaxing that pressing everything (including socks and underpants) is the highlight of your day. 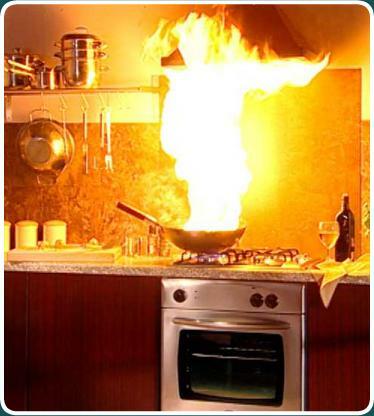 I know the cupboards look a bit sparse but there’s twelve saucepans and a fondue set in my oven. And I’m wearing ironed knickers. 11. Some friends with a young child come to dinner. The child finishes a colossal plate of pasta. Do you…? A) Quickly hide the vegetables, and urge them to go for a jog round the block? B) Ask the parents if their kid has been tested for tapeworms? C) Cry “Well done! Good boy!” and immediately serve him another two platefuls, before the pudding courses commence? A) Squirt bleach into it at arm’s length, slam the lid and flush. B) As above, but swizzle the loo brush round a couple of times before flushing. C) Pour peculiar blue stuff into the toilet and leave it with the bog brush sticking out for about an hour. Then flush the loo and bend right over it, deeply inhaling droplets containing trillions of E-coli, streptococcus and staphylococcus while you scrub your S-bend. Then tell everyone you have no idea why you keep getting these atrocious sore throats since you always keep your house so very clean. 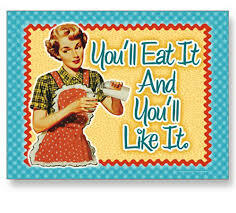 Mostly A: You are a normal, generic housewife and far too laid back ever to be a Sicilian Housewife. 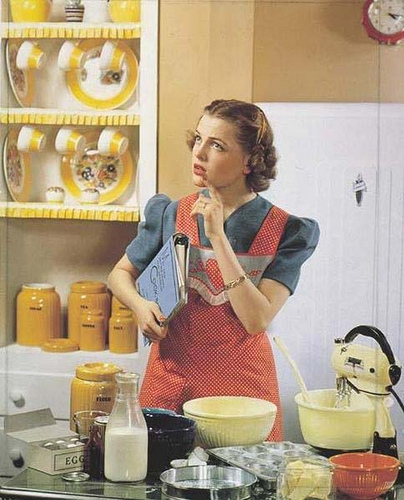 Mostly B: You’re not really a housewife, are you? Mostly C: Congratulations! You are the perfect Sicilian Housewife! If you ever fancy a holiday in Sicily you can stay at my place and sort it out, as I am afraid things tend to be a bit slack round here. I didn’t, but I wonder if he would have any more to add…..
What is he up to? converting his kitchen to a wine celler, maybe? Ha ha! Good idea. I had better start composing a “Siciliain Husband” questionnaire right away! hahaha hilarious! My husband is sicilian and I’m no sicilian housewife! My poor hubby always looks so happy when I occasionally iron something, wash the floor or manage to cook a meal without needing to go to “Pronto Soccorso” for stitches during the chopping stage. He’s realised it will never last, thouggh. Another well-written, oh-so-Britishly witty article! Thank you for brightening my day. As an American of both Sicilian and English descent, I waver between obsessive-compulsive cleaning frenzies and philistine periods of savoring coffee or savoring some chilled Chardonnay. I live vicariously through your Sicilian adventures and hope to return “home” again soon. At least you have the ability to perform when you choose. I’m afraid it is completely beyond me. Do you have a Sicilian husband who expects stem-ironed pants and vests? OR an American one who accepts microwaved meals without complaint? I answered all the questions right !!!!! So your mother never got through to you at all? At least she tried. My Mum was always so busy making massive sculptures or felling trees in the garden that she never even remembered to prepare meals. I actually learned to scramble eggs from a friend’s mother who took pity on me!!! I definitely wouldn’t make the grade. When do they find time for their blogs?! Oh, they don’t have time for ANYTHING. Being perfect is a full time occupation. I am your normal garden variety C…razy and I don’t live anywhere near Sicily. Must be an inheritable OCD condition. What does your suocera think of non-Sicilian housekeeping habits? Amazingly enough, my suocera rarely complains about my deplorable domestic incompetence. I am sure she thinks I am a hopeless Domestic Slobess, but her way of dealing with it is to come over and do my ironing for me sometimes. Honestly, she truly enjoys ironing THAT MUCH!!!! And she has also been known to prepare meals at home and fill my freezer with them. Bless her little steam-ironed cotton socks! Boy, would Costa Rican housewives fit in there! They might even be thought to be over the top! Gosh! 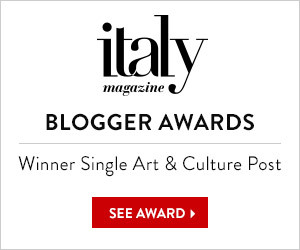 I cannot imagine what they do that goes even further than Sicilian Housewives…. Thoguh come to think of it, I always think of jeans with creases ironed down the front of them as being a fairly classic Latin American housewife thing to do. Do the housewives do that in Costa Rica? Do they starch them, I wonder? My mother-in-law can starch shirts till they also work as bullet proof vests. Years ago when I was a teen ,gramma(who came from Sicily married at 16) flew from Staten Island for a visit with parents and me here in Miami. Mother asked her if she had anything on the flight and she said coffee and that it was terrible but she drank it because “I no wanna make the lady feel bad”. Oh Carl, your pictures are absolutely hilarious! I cannot believe I have never seen your blog before…. how did I miss that? Hahahaha!!! I’ve met lots of true Sicilian housewives and I can honestly say that no matter how long I will live in Sicily I will NEVER be a true Sicilian housewife!!! I did try at first – honestly I did. I have completely given up trying now. It’s so much more fun being a rebel. While I do usually end up preparing all three meals each and every day to be healthy, I have to say my very favorite Q/A of the quiz is definitely 7-B! My fantasy home would have only vending machines in the “kitchen”, stocked daily by chefs. Oh I really think you’re onto something here. I do have a son who fantasises about having a soda vending machine in the house and my husband often talks about getting one of those office tea and coffee machines (the Italian ones actually make great drinks). It would actually be cheaper than buying a fitted kitchen. Having followed that link I see my dream can someday come true! Oh, and way back when my Sicilian Grandma moved in with my parents and us kids, we suddenly had TWO kitchens – fashioning a “summer” kitchen in the unfinished basement so the stove/oven did not heat up the house. It also had a bigger table than our main floor kitchen. I’ve always suspected the Sicilian justifications for having a second kitchen are all excuses, and the women really want them so they have an extra one to enjoy cleaning…. Thanks for the laugh (now I have to change my clothes because I spilled my wine down my front laughing). I’m a B. Oh dear. Not a busy one, either. Love the photo illustrations! Love it! Sums up my own experience as a ‘Sicilian’ housewife perfectly. In case you were wondering, I failed miserably at it! I used to be a wannabe too, but now I don’t wannabe any more! I am proud to be hopeless! You had me in stitches, recognised my “mother-in-law” immediately. I am defiantly remaining as I am which is to say happily unmarried to a Sicilian guy who thankfully would not like me to become like his mother. Ha ha!! Sounds as if you have figured out the perfect solution! I could definitely not make the grade. I traveled to Sicily before, but thankfully I didn’t stay. Would have found it to find a man for myself there based on my answers. Reblogged this on The Dangerously Truthful Diary of a Sicilian Housewife. It sounds like my Dutch mother in law, although her behaviour seems to be out of fear of being judged as slovenly or lazy,…by who, I’m not sure. Is this the same affliction or is there a different motive? Yes, I think that’s the same motivation. 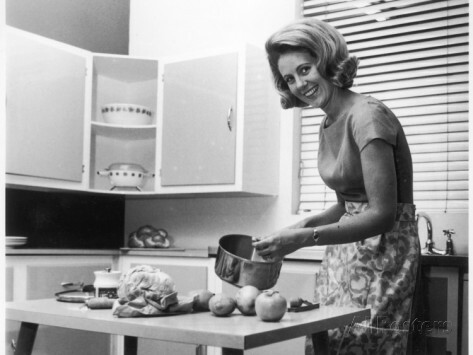 I think a lot of women were brought up by their mothers to feel somehow inadequate, and being a super housewife is their way of proving themselves. And they brag about what they’ve done as a way of showing off. That’s my take on it anyway. I would fail as abjectly as I would as a German housewife. Fensterputzen (Window washing) is simply by some genetic aberration, not in my DNA.